Corporate stationery - its essential to use a reliable print partner that can deliver your printed stationery time & time again. Allison Printers has been producing printed corporate stationery for over 50 years from SME's through to multinational corporations. Our stationery is printed on a smooth bright white laser mill guaranteed stock, so your letterheads will run through either your desktop inkjet printer or your high capacity office copier. If your stationery requires spot colours or specialists finishing, please email through your requirements in the contact us section & a personal quote will be emailed back to you. 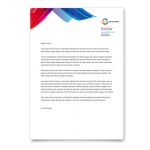 Our compliment slips, like our letter heads, are printed on a smooth bright white laser mill guar..
Our Letterheads are printed on 100gsm - 120gsm bright white ‘laser pre-print” to guarantee that t..